THANK YOU EVERYONE FOR ALL YOUR GOOD WISHES, ENCOURAGEMENT, PRAYERS AND CONGRATULATIONS! We made it in 16 hours 50 min 58 min – thanks to Eddie, my amazing pilot and crew and Ann-Carin, super-enthusiastic, competent and positive helper! Landed right on the Cap in the dark, felt like sacred Channel swimmers ground! Was not sure till the last half hour whether currents would not have us do a couple of more hours and whether I would be able to make it qt all. But I felt strong till the end, the water was almost warm towards France, and air temps were up during the day and even the early night in France was balmy (last nigh had been freezing I believe). Now hot bath, some sleep and on…. France visible in the back! Getting closer by the hour – but will we make it? The German flag is flying at the Ridge – yeah! Thanks Evelyn and Dave! Maybe Friday – or even earlier? 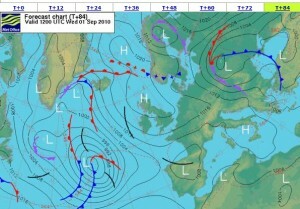 High pressure zone forecast - there is hope! Back in Dover late Saturday morning. Up to Varne Ridge with my luggage and back to the harbour for just 1 hour of swimming. The sun is out – after a week or more of horrible weather. No swimmers were able to go on the last tide – and they have prepared for a year or more and come from all corners of the world. This is what Channel swimming is very much about! Saturday night the bank relay teams went out for their wetsuit Arch to Arc relay triathlon (Marble Arch, London, to Arc de Triomphe, Paris), but it seems none of them made it. Many got seasick from the huge waves. They were still dropped in Calais to continue biking to Paris. Would I do the same if I don’t make it again, I mean, continue biking and running? France seems to look closer than ever. Maybe due to our successful relay last year, where I was allowed to touch French sands again? And after swimming Lake Zurich only recently – France looks just that tiny bit further, and of course, the currents are a “little” stronger etc. My visualisation is more on the biking and running, strangely, as if the Channel was already done. Many times during training I had seen myself swimming safely alongside Anastasia and imagined swimming the last bit to France. 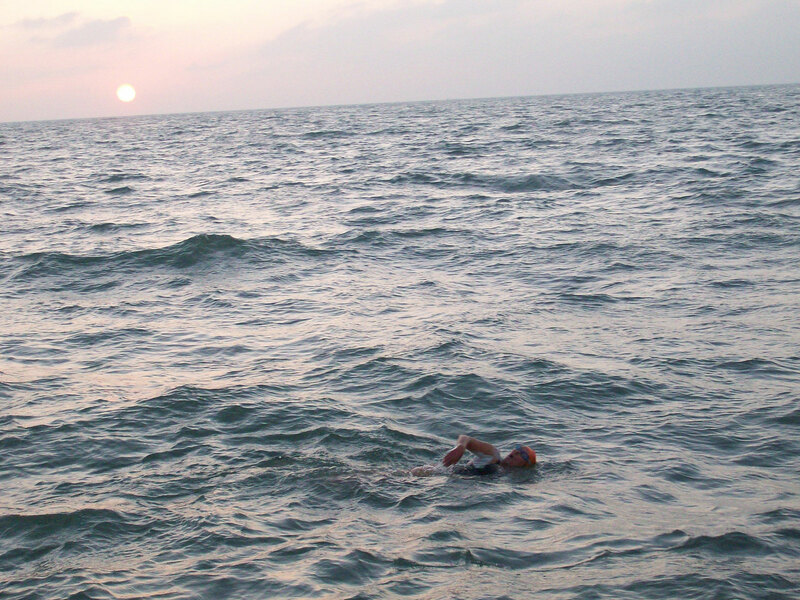 Miyuki (Japanese "Channel Queen" with 7 crossings) is back, she wants to do 2 swims this year! Woke up late on Sunday, but catching up with sleep is important now. No swim before Wednesday at the earliest for me, basically agreed on Friday, if the weather is holding. Before Wednesday I would have no helpers for the biking and running. So a 3 hour swim without feeding on Sunday on Freda’s advice, maybe 3 hours again today, for best possible acclimatasation. Then more tapering. If anyone wants to come down to Dover to help on the boat on on Friday (start would be around 4/5 a.m.) – there is still room, also in the caravan! Fr. 13th at midnight I boarded the Euroline bus again to Dover. We arrived late on Sat. morning, and the Dover Regatta was on, with swimming only allowed until 12 p.m. on Sat and Sun – so much for a last long swim! In spite of horrible weather forcasts it rained only occasionally, more of a drizzle, and the sun came actually out quite a lot! So I did 2 hours on Sat (was extended to 1 p.m.), gave Freda her Zurich lake T-Shirt (she had asked for one and liked it a lot! ), did 5 hours on Sunday, then 2-3 -5 from Monday to Wednesday. Wednesday night I took the bus back. 2 hours of running up to Varne Ridge and over the cliffs with big blisters at the end – my feet have become tender for not running much lately! The weekend of 21st/22nd I went to see my parents near Nürnberg – my father was celebrating his 75th birthday and was happy and proud I was part of it (most of the guests new about his adventurous daughter and many approached me about my swimming of course). It was a hot weekend again and getting to swim in a (crowded) pool was out of the question. To my big surprise I still got a nice swim in on Sunday – we drove for an hour to a huge lake which I had not really been aware of as so great for swimming (Großer Brombachsee). The water was nice and cool (19/20°C), clear, and the distance to the other side and back was 5 km. I got two hours in and some fooling around with my nieces. My sister had joined my parents and myself with her kids and thy used the opportunity to get a little crawl coaching. Tomorrow at midnight I will board the bus again to Dover. The last neap tides had been horror for swimmers and pilots – wind, wind, wind – not a single swim. The forecast for next week leaves a little bit of hope: from Wednesday on the wind might calm down a little. But you never know. The weather in the Channel can change overnight. 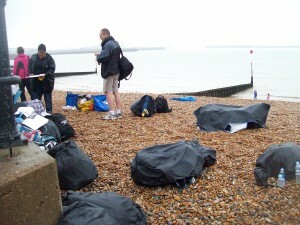 The helpers for my van are ready to go from Wednesday on – only for the swim I have no helper yet. I am not particularly worried, since it has happened repeatedly with friends that their helper was useless anyway (“feeding the fish” most of the time), but I will have to keep asking around. By the way, my goal for this year, if I make it across to Calais, will only be Dover-Aachen. Distance-wise it is about the same distance as Vedika did in 1998 from Dover to Paris – the original vision that emerged back in 1985 right after the first two successful Channel swims in our team – by myself and Adhiratha. It feel good to only have a “small triathlon” ahead – room for transcendence in a few more years. Dover-Heidelberg is still in my heart – an old dream that one day will manifest, I am sure. Angikar did it – on August 8/9th! First Serbian to swim the Channel, probably. And solo number 40 from our international team! As it turned out, Alison’s boat must have never gotten ready, in any case Angikar swam on Sunday, August 8, already on a spring tide (6.1 and 6.3 meters), into Monday with Alison’s brother Neil Streeter on Suva – finishing in 19 hours 24 (inofficial time). No shoulder problems, no sinus problems, just 30 min. of sickness – but lots of Grace, he said. He was very happy and felt it was easier than he had expected/feared. 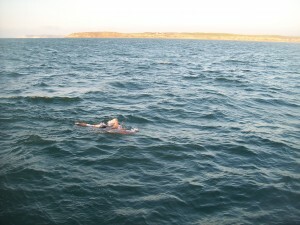 As a slow swimmer he had been prepared for 20 hours and more and felt he could still have continued if necessary. 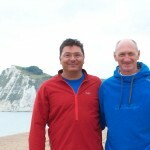 Dori had started a tide earlier – Saturday night around 10 p.m., reached France in 10 hours 40, turned to swim back to England, but stopped after 13 hours due to shoulder problems. Conditions must have been rough during the night. Also swimming was Australian John Van Wisse attempting a triple-crossing, but he stopped after a very fast double in 19 hours 55. Happy after first 6 hour swim in 17°C this year - on a sunny Sunday! increased body fat percentage. Nicely choppy at the eastern end, so good training. Sunday 6 hour swim (no official 7 hours that day) – which was fine for me, but I still felt good at the end. Monday 2 hours in the morning, with Dori Miller (USA, but based in Sydney, fast solo in 2008) who was tapering for her 2-way attempt and a few other Australians, then a short break, and around 2 p.m. back into the water for another two hours after meeting up with team mates from Serbia, who were waiting to go as soon as weather – and Alison’s broken boat – would permit (later we went to the Marina to see the boat – it was an absolute mess of repair, something had burned, and it did not really look like it would be ready for the start of the tide on Monday). The last half hour of swimming was the best – into the late afternoon sun lighting up the water and into glittering waves. Short visit to Shakespeare beach with my Channel aspirant teammate and his helper (both accomplished long distance runners, only Anigkar does not look like a runner any more, which is good for him right), followed by collecting my stuff and a going for a final Pizza with more talk about Channel swimming details, before boarding the bus at 7 p.m. back to Heidelberg.